November is upon us and finally I can feel the weather getting colder. 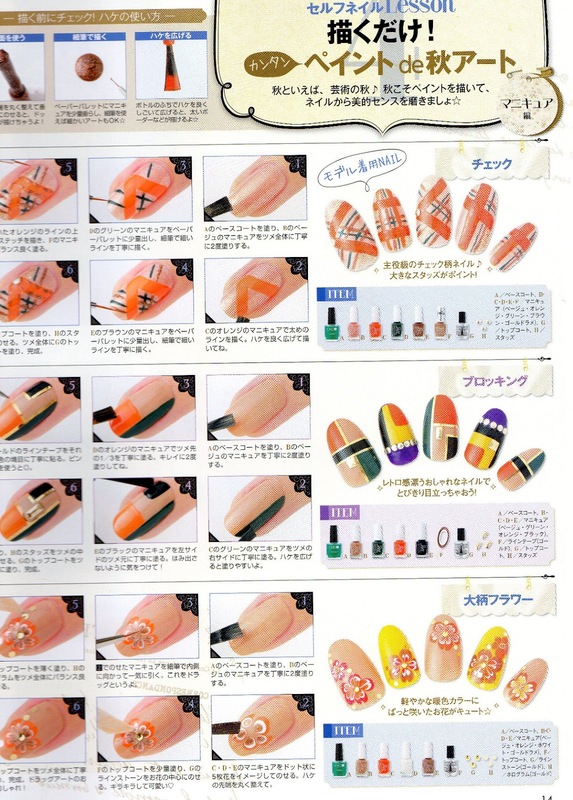 So for this month's nail inspiration, I have for you easy to follow step by step nail art tutorials with a fall theme as seen in the November edition of Nail UP! Magazine. First we have three nail art tutorials using easy to find nail art parts like glitter, nail decals, pearls and rhinestones or Swarovski crystals. Use top coat to glue the smaller parts and glue for the bigger parts. 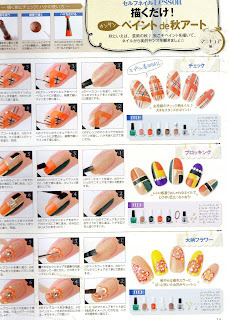 If you have a steady hand you can try the following designs that can be made by using different colours and brushes. For the thicker lines use your nail polish brush after carefully wiping the extra polish on the inside of the bottle neck. For the finer lines, put a drop of nail polish on a paper palette and use a fine nail art brush. What do you think dear readers? Are these tutorials easy to follow, or do you find them confusing? Glad you liked them. Did you try any of them? Loved all of the designs!!! 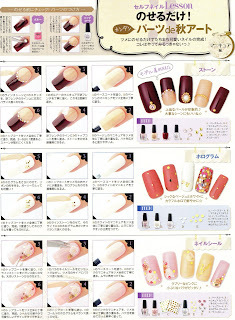 I usually find the tutorials in Japanese nail magazines not very hard to understand. applies for these as well. I had to laugh a little bit though, because of the "needle" marble in the painting tutorial :D I might try that one... seems easier than my random mess, hehe. Great inspirations! Thank you for sharing!!! amazing!! !απλά πρέπει να μου τα κάνει άλλος γιατί μόνη μου,μου φαίνεται πανδύσκολο!! !